Gears Product Line Engineering Tool and Lifecycle Framework | BigLever Software, Inc. Gears is the technology foundation for your Product Line Engineering (PLE) Factory. 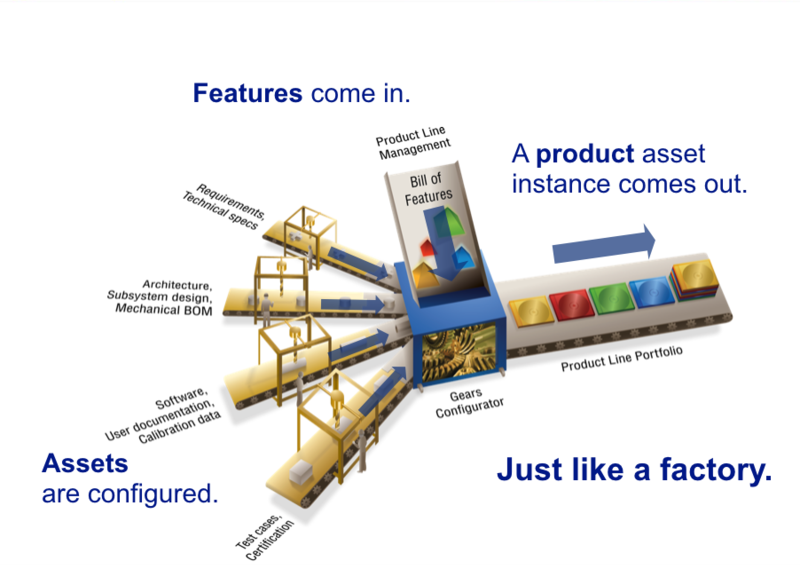 BigLever’s industry-standard Gears Product Line Engineering Tool and Lifecycle Framework™ provides the technology infrastructure for establishing your PLE Factory — the underpinning of BigLever’s leading-edge Feature-based PLE approach. Feature-based variation management meets automated production. A Feature-based PLE Factory is much like a typical manufacturing factory except that it operates on digital assets rather than physical parts. To establish the factory, your organization creates a “superset” supply chain of digital assets that can be shared across the entire product line. These digital assets are equipped with all the feature options offered in the product line. The features chosen for each product are specified in the Bill-of-Features — then, a product asset instance is created by the Gears product configurator. The PLE Factory, based on Gears, becomes your automated production system for assembling and configuring the shared digital assets based on the features selected for each product variation, with the push of a button. Take a closer look at the PLE Factory. Common PLE concepts and constructs — across the lifecycle. With BigLever’s Gears, your organization has a common set of PLE concepts and constructs that augment your tools and assets, which allows engineering processes to flow cleanly and efficiently across the full lifecycle — from requirements to design, implementation, testing, delivery, maintenance, and evolution. A feature model that can uniformly express the full product line feature diversity for all assets in all stages of the lifecycle. A variation point mechanism that can be uniformly applied to your tools and their associated assets in all stages of the lifecycle including requirements, modeling, source code, BOMs, testing, configuration management, build management, change management, and documentation. An automated product configurator that uniformly assembles and configures assets from each stage of the lifecycle to automatically produce the products in your product line, based on the features selected. Gears, BigLever’s desktop version, provides an all-in-one development environment for establishing, managing and operating your Feature-based PLE Factory. It offers a powerful collection of editors, constraint managers, wizards, analytical tools, and the product configurator for automatically producing the products in your portfolio. This Gears version also provides a PLE Bridge API for integrating with your existing tools by making them “product line aware” — to ensure consistent PLE capabilities directly from the Gears Framework. BigLever’s new Enterprise Gears provides all users with browser-based, role-specific access to the appropriate view of Gears they need to do their jobs – enabling PLE to be more quickly adopted and implemented across organizational functions. It allows both technical and non-technical users to inspect existing production lines from a browser, with nothing to install. This solution offers interactive graphical diagrams for feature models and feature profiles, and a Server API for accessing PLE models to support custom extensions and integrations with enterprise systems and applications. >> Enterprise Gears data sheet. The Gears PLE Lifecycle Framework is also the technology foundation for the PLE Ecosystem — an open community of world-class tool providers established for the benefit of engineering organizations seeking consistent, compatible, fully unified PLE solutions. The current PLE Ecosystem includes integrations with Aras, PTC, IBM Rational, No Magic, Sparx Systems, Madcap Software, Perforce, Microsoft and Open Source. The Ecosystem continues to grow as BigLever, our partners, and our customers add new integrations and strengthen the capabilities of existing ones. >> Learn more about the PLE Ecosystem.